Featuring the world's first quad camera in a smartphone, the Samsung Galaxy A9 packs cutting-edge technology in a stylish, premium design. Shoot with confidence with the Galaxy A9's ultra-wide camera, telephoto camera, 24-megapixel main camera and depth camera. The intelligent camera system in the Galaxy A9 automatically selects the optimum settings for every condition, so you can snap away whenever inspiration strikes. Immerse yourself in the Galaxy A9's Infinity Display. The 6.3-inch FHD+ Super AMOLED screen boasts sharp contrast and dynamic colours to give you the ultimate viewing experience. The sleek design and premium 3D glass casing provides an easy grip as well as a bold fashion statement. Say goodbye to stuttering videos and slow switching between apps. 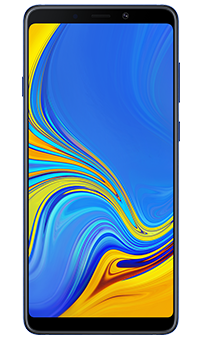 The Samsung Galaxy A9 boasts high performance with breath-taking response times to let you get more done throughout the day, quicker than ever, thanks to its powerful octa-core processor and 6GB RAM. The Galaxy A9 lets you keep your photos, apps and other information safe using advanced biometric security features. With Face Recognition and fingerprint scanning, only registered users can unlock your phone, access certain apps and sign in to secured websites.